"Carbonized" Bamboo Flooring - What Does It Mean? Is Carbonization A Color Or A Process? The simple answer is it's both! Bamboo is carbonized by subjecting it to high heat, which “caramelizes” the bamboo fibers—resulting in a rich brown hue. It’s a similar process to “caramelizing” sugar, which turns dark and gooey after being heated. Is Carbonized Bamboo Different Than Other Types Of Bamboo? Though the same color could be achieved with staining, there are important differences that need to be taken into consideration. Unlike staining, which only affects the surface of the wood, carbonized bamboo is the same color throughout the plank—which means that it can be refinished and will retain it's same rich color. The darkness of the color is proportional to the length of time the bamboo is heated or "carbonized". Is Carbonized Bamboo Flooring Durable? If you've seen Janka Hardness test results you probably already know that strand woven bamboo floors are some of the most durable hardwoods in the market. Carbonized bamboo flooring is also an excellent choice if you’re looking for beauty, ease of maintenance, and versatility. This is a major reason why they're used in high end luxury apartments and rental properties. Because of the way we manufacture our carbonized bamboo floors they are extremely tough and long lasting. 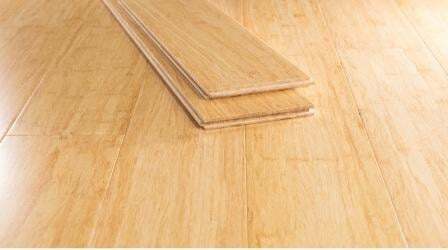 Strand woven bamboo flooring is made when heated strips of bamboo are separated into strands, then woven together and compressed with high-pressure heat and environmentally safe resins. The weaving structure reinforces and increases the strength of the bamboo, resulting in floors that are many times harder than traditional hardwoods. All of our carbonized bamboo floors are finished with our patented AccuSeal Ultra® finish system, which comes with a lifetime warranty and ensures hassle-free cleaning. Made with cutting edge industrial materials under the strictest manufacturing standards, this 10-coat protective finish ensures the perfect combination of beauty and durability. Here at Ambient, quality matters, so you and your family can walk (and even run!) easy knowing that your flooring will last for years to come. The quality of bamboo can affect the hardness of the floor—this is why we only use fully mature Grade A Moso bamboo harvested at 5-7 years of maturity, from responsibly managed or FSC-Certified forests. We wouldn’t think of offering our iron clad warranty if we didn’t use only the best materials for our products. Check out some of our gorgeous carbonized floors such as our Carbonized Antiqued Strand Bamboo Flooring and our Carbonized Click Lock Engineered Bamboo Flooring. Our carbonized bamboos also offer an excellent foundation for a variety of custom darker colors like our world-famous Coffee Handscraped Flooring. The carbonization and marbling effect imparted by the strand woven construction process create a naturally random and beautiful grain similar to hardwood and warm underfoot, making it the perfect option for creating a “lived in”, vintage atmosphere. Given the impressive strength and resilience of strand woven bamboo, refinishing is rarely necessary—but in the occasion that it does, carbonized bamboo can be refinished without losing its color (unlike stained bamboo and hardwoods). This is an important distinction: whereas stained flooring can only achieve the desired look with the use of chemicals, in contrast, the color of carbonized bamboo is achieved with non-toxic, high pressure heating methods. The benefits of choosing Ambient’s carbonized bamboo floors go beyond style and substance. 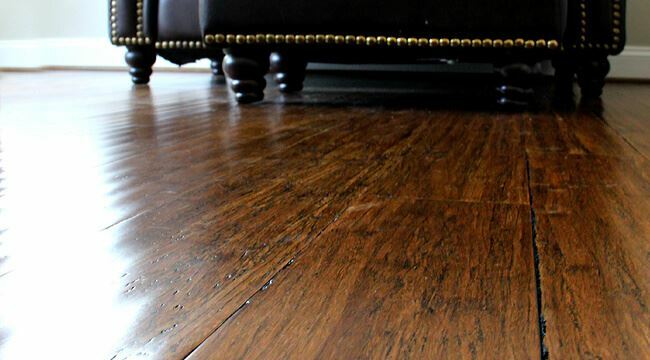 It’s a non-toxic, kid, pet, and high heel friendly floor that lets you live and enjoy your life without the constant worry and hassle of complicated maintenance, and it won't look dented up and require refinishing after 10 years like hardwoods. The deep, varied hues of carbonized bamboo offers the warmth, elegance, texture, and atmosphere that hardwood flooring provides, along with affordable costs of installation and maintenance. 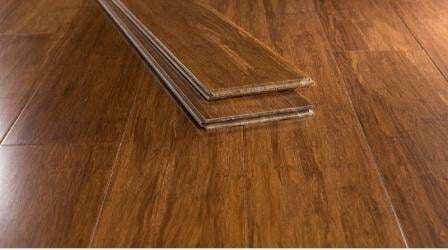 It is also widely regarded as THE environmentally friendly alternative to hardwoods, and an important consideration if you want formaldehyde free floors that are safe for indoor air quality.